11th June, 2013. Mumbai. The portfolio of India’s largest consumer goods, beverages and personal care products company, Hindustan Unilever, has the largest number of trusted entries from a single group in The Brand Trust Report, 2013 (BTR 2013). 37 of HUL’s 45 brands were listed among India’s Most Trusted Brands in the report. 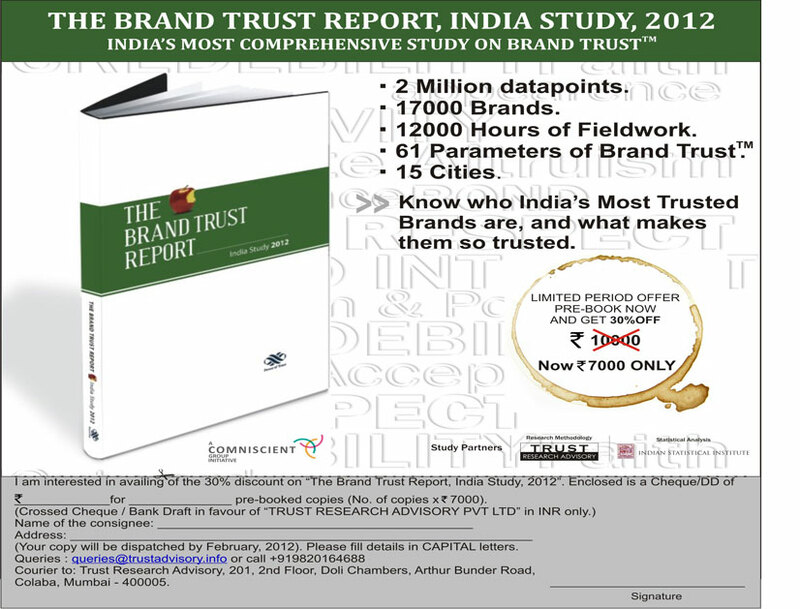 The BTR 2013 is the third in its series, and has listed India’s 1100 Most Trusted Brands arising out of a primary research conducted across 16 cities on its proprietary 61-attribute Brand Trust Matrix by Trust Research Advisory (TRA). Lux leads the HUL portfolio ranked India’s 15th Most Trusted Brand, followed by Dove (India’s 19th Most Trusted) and Ponds (India’s 23rd Most Trusted) is third most trusted among the HUL brands. HUL weighs heaviest in the Bath/Beauty category HUL with 18 brands among the 68. In the Tea Category among F&B brands, HUL has four brands among the six listed in the report. These are Red Label (262nd), Lipton (343rd), Taj Mahal Tea (442nd) and Taaza (782nd). 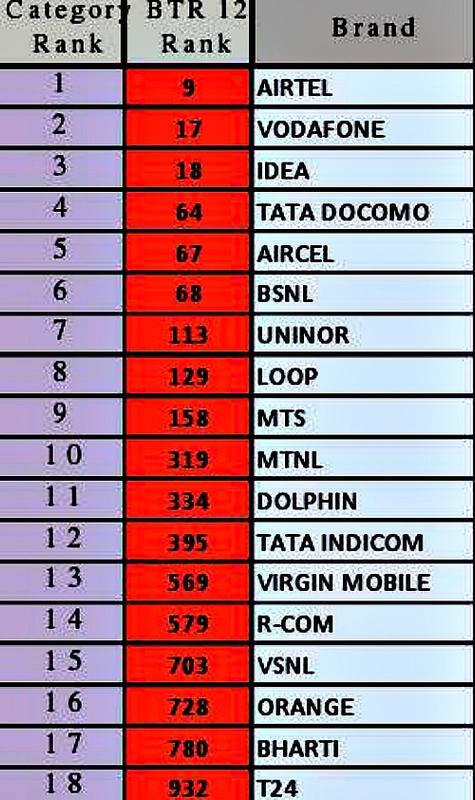 In the Homecare category, two HUL brands, Domex (All India 187th Most Trusted) and Vim (All India 250th Most Trusted) hold the first two positions. In the Fabriccare category, Tide (All India rank 60th) from the Proctor & Gamble stable is the leader, followed by three HUL brands, Surf Excel (63rd), Rin (110th) and Wheel (271st). The Hindustan Unilever brand, independently listed in the report was ranked India’s 324th Most Trusted Brand. The umbrella brand has fallen substantially this year and had been ranked the 60th Most Trusted brand in India in last year’s report. TRA is launching another report titled India’s Most Attractive Brands in August 2013, the primary research for which is currently under way. Trust Research Advisory (TRA), a part of the Comniscient Group, is a company dedicated to understanding and simplifying concepts related to Trust. TRA was conceived in 2008 to decipher, analyze and measure Brand Trust, to make it universally understood and easily applied. The organization’s focus areas include Research, Publishing, Trust Introspection, and Licensing. Committed to create metrics for efficient resource allocation for brands spends, TRA owns the global copyrights for the Brand Trust matrix. TRA launches The Brand Trust Report in the beginning of every year and the current issue is the third in the series. TRA is also soon launching a new report, India’s Most Attractive Brands based on a proprietary Attraction Matrix made of 36 attributes. Hewlett Packard (HP) has been ranked as India’s Most Trusted Technology brand a primary research conducted among 2718 influencer-respondents in 15 cities. India, 16th April 2012: Hewlett Packard (HP) has been ranked as India’s Most Trusted Technology brand for the second year in a row, in a primary research conducted among 2718 influencer-respondents in 15 cities across India through which 17,000 unique brands were ranked on Trust. The research findings were conducted by Trust Research Advisory (TRA), and published in The Brand Trust Report, India Study, 2012 which lists India’s 1000 Most Trusted Brands. The study is conducted on TRA’s proprietary Trust Matrix and studies 61 ingredients of Trust. With 43 brand entries among India’s 1,000 Most Trusted Brands, Technology ranks as the fifth Most Trusted Category inIndia. HP is followed in second place by Dell and Apple follows as India’s third Most Trusted Technology Brand. Overall, this year Hewlett Packard was ranked as the 22nd Most Trusted Brand in India, up one rank from last year. Have you booked your copy yet?